Every year, 55% of the CLS operating budget comes from your donations. 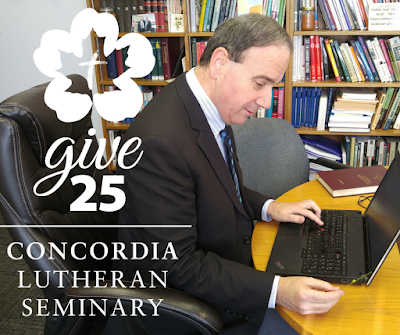 In an effort to make it easier for our donors to make small recurring gifts, we have launched the give25 campaign. I’m so grateful to be a new partner to Concordia Lutheran Seminary in its “Give 25” effort. The Lord has brought so much blessing to our church through this treasured place, and I hope many of you will get involved – as I have – in this very manageable, ongoing way! Through the give25 campaign, we are seeking $25 per month from 1000 donors. We're looking for 10 donors from each of 100 LCC congregations to commit in 2017. Although C.S. Lewis wrote The Chronicles of Narnia for children, the series is better understood by adults. This year's second Quest course explores the Narnia books from a grown-up perspective, covering the series as a whole as well as each of the seven novels within it. It will be taught by Dr. Joel Heck, an internationally recognized specialist on C.S. Lewis. Dr. Heck is a veteran professor of theology at Concordia University Texas and will be serving CLS as a visiting professor during our winter semester. This Quest class is offered as a webcast for distant participants. Time & Date: 7:00pm - 9:00pm, Jan. 31, Feb. 7, 14, and 21, 2017. Cost: No registration fee - donations welcome. Some Previous Quest courses can be found on our YouTube Channel.